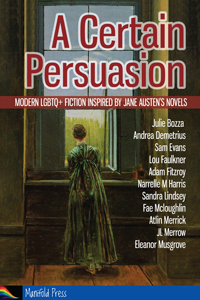 Way back in 2016 I wrote a short story, Man of War, for Manifold Press‘s Jane Austen inspired anthology A Certain Persuasion. When this anthology was launched at Queer Company 2, all contributing authors were invited to write a short article, related to the story we had written, for the conference programme. As my story was set aboard a Royal Navy sloop of war in the age of sail, my contribution centred around nautical matters. And because this was written in the summer or early autumn of 2016 – after the UK referendum on leaving the EU, and in the lead up to the presidential elections in the USA, I got a little philosophical towards the end. I was reminded of this piece earlier today when a couple of friends were using maritime allusions in discussing dealing with intense emotions (the need for a safe harbour). 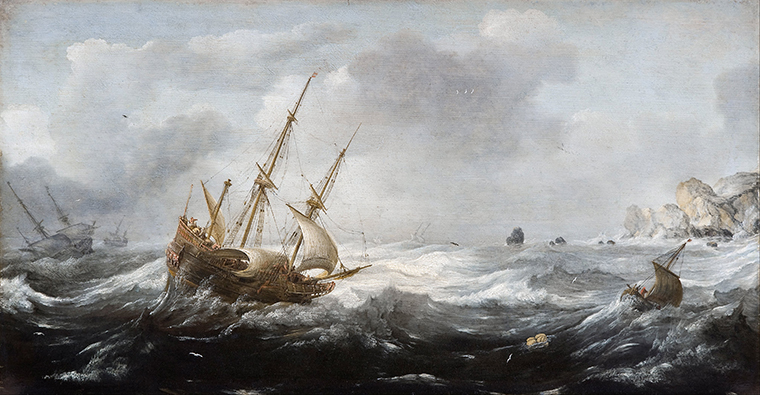 When one of them extended the metaphor to point out that in sailing, to survive a storm you take in your sails, face the wind and ride it out, I remembered I had written something about righting a ship. It was my love of stories set in the Age of Sail which led me, eventually, to Jane Austen, and Austen who led me to search deeper into the history of that era and discover that the world within those ‘wooden walls’ was not as exclusively male as we generally believe. As a child, I had read and re-read of frigates, clipper ships and windjammers in Time Life Books’ The Seafarers series; as a teenager I discovered (and maybe fell a little in love with) CS Forester’s Captain Horatio Hornblower, R.N. yet it was only when I reached my twenties and read in Persuasion of Mrs Croft’s “reddened and weather-beaten complexion, the consequence of her having been almost as much at sea as her husband” that I realised women had gone to sea as anything other than passengers! Fortunately, historians have been working over the past few decades to redress the balance, and bring to our awareness a fuller picture of life in times past. 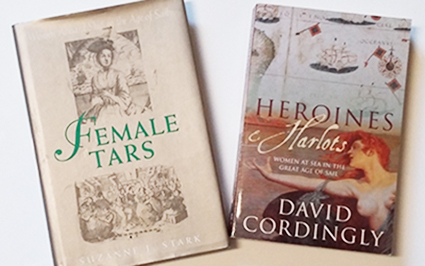 David Cordingly’s Heroines and Harlots is the easiest volume to find on the subject, and reading that led me to Suzanne Stark’s Female Tars with some wonderful accounts from primary sources of the true stories behind folklore’s trope of “women disguised as men”. What we can’t know for certain, at this distance in time, is how these people truly saw and described themselves. Would they recognise our modern understanding of the gender spectrum, or would they disagree and place themselves firmly on one side or other of the binary? This is a question I find myself drawn back to, and it is of course unanswerable. Even the few surviving first-hand accounts we have available are unlikely to yield the truth of a person’s experience as they were produced and published on a commercial basis, and we are very unlikely ever to find a version which has not been edited to suit contemporary social beliefs and expectations. Whilst our modern understanding is that Georgian and Regency Britain had a very definite gender divide, we also know that it was a time of great discoveries in the Western world; reading textbooks (or their equivalent) from this period leaves one with the feeling that all life’s questions and mysteries have a solution if only one investigates deeply enough. Anything might be possible. One thing which sums up this approach, for me, is that The Young Sea Officer’s Sheet Anchor (first published in 1808 and became the standard text for training officers in the Royal Navy) includes the section “A Ship on her Beam Ends” – advice regarding how to right a ship. In essence this is similar to dinghy sailors righting their boats by standing on the centre-board, but on a larger scale and using the power of the wind and sea rather than human effort alone. It is this ingenuity which draws me into reading and learning about the past. When I see the problems solved by people without our modern tools – even without some of the mathematical theorems engineers and physicists take for granted – it gives me hope that we can solve the problems that exist in our world today. Like righting a ship on her beam ends, persuading people to afford the same freedoms to everyone requires us to find the correct method of applying a power greater than ourselves. We’re getting there, and stories are an essential tool – a fulcrum with which thoughts can be levered from one position to another. I'd better get back to writing up my thoughts after Eroticon now, hadn't I!